Sceptizard X in game: 1,059 Who? Important notice! Pokemon Sceptizard X is a fictional character of humans. 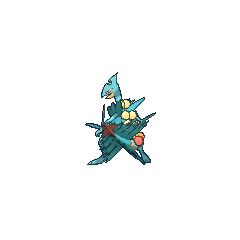 Sceptile (Japanese: ジュカイン Jukain) is a Grass-type Pokémon introduced in Generation III. It evolves from Grovyle starting at level 36. It is the final form of Treecko. 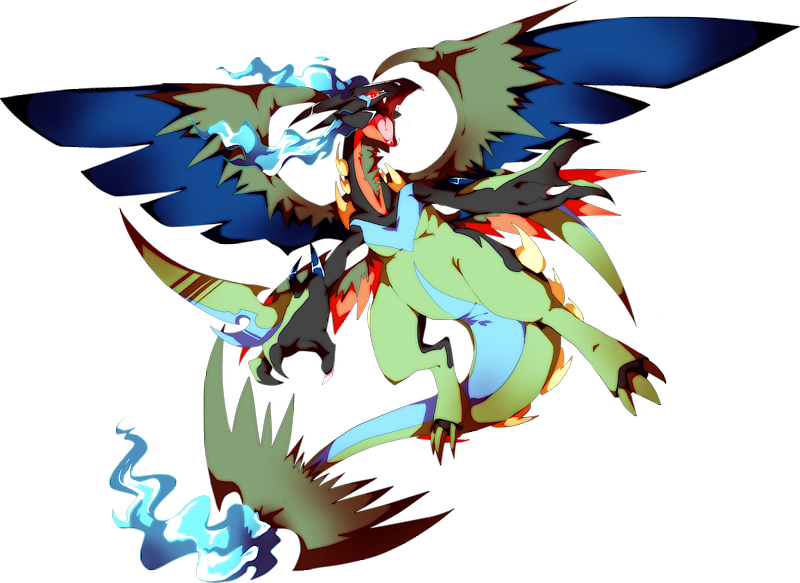 It can Mega Evolve into Mega Sceptile using the Sceptilite. Sceptile is a reptilian, bipedal Pokémon. Its neck is somewhat long, and it has two crests on its head. It has semicircular, yellow eyes with red rims. Its lower jaw and a belt-like band across its waist are also red. Along its back, it has two lines running down the middle and two rows of yellow nodules that are described as seeds. Its tail is shaped similar to that of a palm tree's branch. Both of its long arms have two sharp, elongated leaves and three claws. These leaves allow it to use its former signature move, Leaf Blade. As Mega Sceptile, its head crests become more pointed with a round portion missing from the middle. Red marking surround its eyes, which become smaller and more narrow. The yellow seeds down its back grow larger. The last pair of seeds turns red, while the pair above it turns orange. Red stripes encircle the base of its tail and run across its lower belly. The leaves on its wrists become more pointed, and the upper ones have red tips and half-circles cut out of the middles. Covering its chest and shoulders are plates of leaves similar to those that form its tail. Mega Sceptile's tail grows longer and develops a red stinger at the tip. Mega Sceptile can cut off a portion of its tail to fire it like a missile at an opponent. Sceptile is a jungle Pokémon. The seeds contain nutrients, which are said to be able to revitalize trees. It is capable of leaping freely from branch to branch. While it has the ability to slice down thick trees, it is known to care lovingly for the plants in the forest. This Pokémon regulates its body temperature by basking in sunlight. 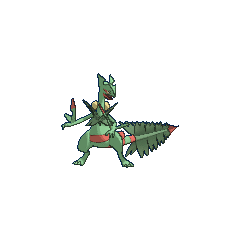 Ash's Grovyle evolved into Sceptile in Odd Pokémon Out. Sawyer's Grovyle was revealed to have evolved into Sceptile in A Meeting of Two Journeys!. In Valuable Experience for All!, it was revealed that it can Mega Evolve into Mega Sceptile. Sceptile first appeared in Shocks and Bonds under the ownership of Tyson. It was used to battle Johnny's Aggron during the Ever Grande Conference. A Coordinator's Sceptile appeared in Last Call — First Round!. It was used in a Double Performance along with a Blaziken in the Sinnoh Grand Festival. A Sceptile appeared in the opening scenes of Zoroark: Master of Illusions. A Sceptile that can Mega Evolve into Mega Sceptile appeared in Mega Evolution Special II. AG161 Sceptile Ash's Pokédex Sceptile, the Forest Pokémon. Its arms are equipped with razor-sharp leaves, and it moves lightly through tree branches in order to attack its enemies. XY106 Sceptile Serena's Pokédex Sceptile, the Forest Pokémon, and the evolved form of Grovyle. 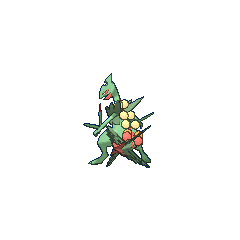 The seeds growing on Sceptile's back are brimming with vitamins that can revitalize trees. A Sceptile under the ownership of Brendan appeared in The Vision, which helped Brendan infiltrate the Team Magma Hideout. Like most other starter Pokémon, Sceptile has made its only notable appearance in possession of Emerald, being picked as his final battling member for his Battle Factory challenge, which it won after a tough fight. 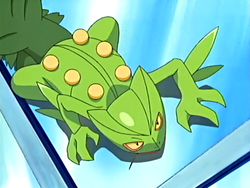 Once he deduced it was no rental Pokémon, but one smuggled in by a third party, he took it into his possession and used it to challenge the Battle Pyramid, Battle Arena, Battle Palace, and Battle Dome challenges, in which only the latter its team failed to win, due to Emerald making a last-minute decision to switch out his party of Sceptile, Sudowoodo, and Dusclops, feeling that its newly recovered memories and affection for its teammates when under Professor Birch's care would slow it down. It was able to learn the ultimate Grass-type attack Frenzy Plant and helped defeat Guile Hideout's giant, fake Kyogre. Rald has a Sceptile which is one of his main Pokémon. It first appeared in Enta Arrives at the Battle Frontier!. 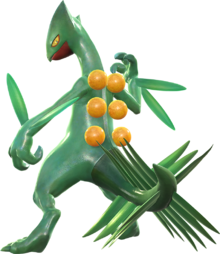 Sceptile is a Speed-type playable character in Pokkén. 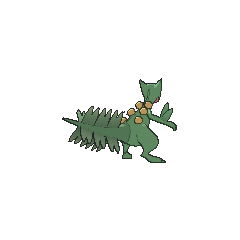 Moves it can use include Bullet Seed, Detect, Leaf Blade, Leaf Storm, Leech Seed, and Giga Drain. Upon entering Burst form, it Mega-Evolves and can use the Burst Attack Forest's Flash. 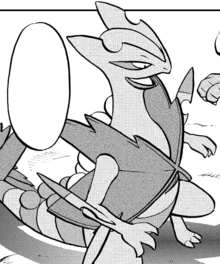 The leaves growing on Sceptile's body are very sharp edged. This Pokémon is very agile - it leaps all over the branches of trees and jumps on its foe from above or behind. In the jungle, its power is without equal. This Pokémon carefully grows trees and plants. It regulates its body temperature by basking in sunlight. The leaves on its forelegs are as sharp as swords. It agilely leaps about the branches of trees to strike. The leaves growing on Sceptile’s body are very sharp edged. This Pokémon is very agile—it leaps all over the branches of trees and jumps on its foe from above or behind. If the opponent has the Ability Mold Breaker, Turboblaze or Teravolt, or the Pokémon is affected by Gastro Acid or has its Ability replaced, the effectiveness of Electric-type moves is ¼×. 51%-100% HP Witness how sharply my leaves cut! 26%-50% HP It seems my HP has fallen to half already. Level up I've leveled up! My leaves are sharper edged now! Sceptile slashes with the leaves on its arms. It will cut anything that can be cut. It dashes about quickly while shooting leaves to attack. Does more damage when the opponent has more HP left. Erases Pokémon (max 3) of the same type as Mega Sceptile. 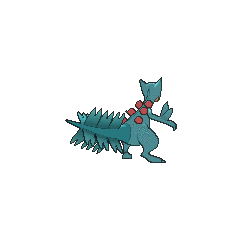 For other sprites and images, please see Sceptile images on the Bulbagarden Archives. Mega Sceptile has the highest Special Attack and Speed stats and base stat total of all Grass-type Pokémon. Mega Sceptile also has the highest Speed stat of all Dragon-type Pokémon. Sceptile has the lowest HP base stat of all fully evolved starter Pokémon. 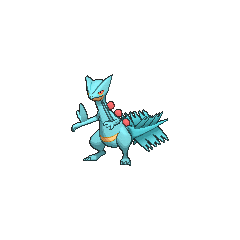 Appearance-wise, this Pokémon resembles the dinosaur known as Dilophosaurus. The orbs of nutrients on its back may be based on the fact that many leguminous plants have nitrogen stored in nodes on their roots. The leaves on the tail in combination with the brightly-colored orbs on its back also make a strong resemblance to both the yew tree and various members of the genus Podocarpus. The Treecko line's appearance and mannerisms are also strongly derived from leaf-tailed geckos. 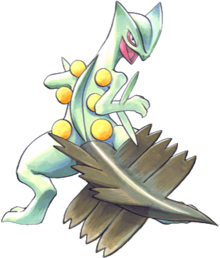 Sceptile may be a combination of reptile and Sceptridium (referring to its fern-like tail) or sectile (referring to the sharp blades growing on its body). It may also derive from scepter (from its title as "King of the Forest") or scissors (referring to the blades on its wrists). Jukain may derive from 樹海 jukai (abundant leafage). Cantonese Chinese 蜥蜴王 Sīkyihkwòhng Literally "Lizard king"
Mandarin Chinese 蜥蜴王 Xīyìwáng Literally "Lizard king"